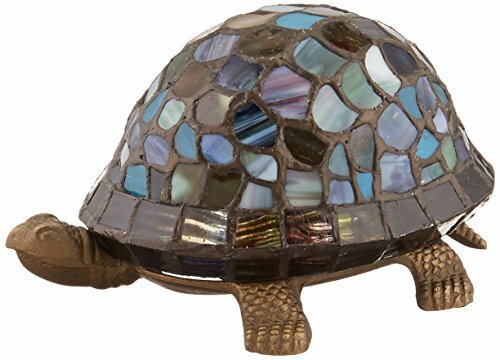 Our artisans are known for their meticulous attention to detail and nowhere is that attention to detail more evident than this delightful blue turtle accent lamp. 143 pieces of hand rolled and copper foiled art glass in glistening opalescent shades of blues, greens, cream and red form the shell of this little reptile. The turtle's body forms the base of the lamp. The scaly detail of the turtle's skin is so realistically represented in the cast detail, which is finished in antique bronze. This little fellow is perfect for any room in your home or office where you want to add a little touch of whimsy to your décor.